We eat a LOT of vegetables. It is funny because before I got cancer, I rarely ate vegetables. Usually just once a day at dinner. Now I eat them all day long in every meal and snack. They are what KEEPS us full and satisfied and what we should be eating the most of. I just never knew much about fresh veggies. It wasn't the norm in my house growing up. SO I had to learn! One thing I learned is that I love Asparagus, but I also dislike asparagus. I love perfectly roasted asparagus and I dislike overcooked asparagus. Asparagus should NOT be mushy people! Here is how to make the perfect al dente asparagus. 1. Preheat oven to 400 degrees. On a baking sheet, arrange the asparagus in a single layer. Toss in the olive oil and sprinkle with salt and pepper. 2. 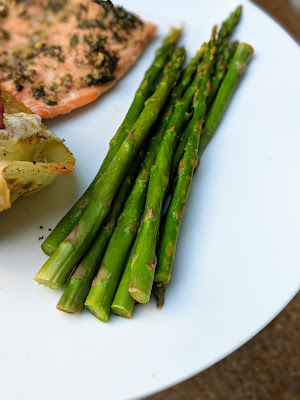 Roast for 8 minutes or until the asparagus is crisp on the outside and tender in the center. It is NOT supposed to be mushy!!! 3.Toss in the garlic, and lemon juice. Add more if desired. Serve immediately.